Light a Charcoal Grill – Summer is just around the corner, and you know what that means for many foodies. Roasting meats over flames and feasting on sausages, burgers, seafood, and even veggies. Everybody knows that a good barbecue starts with lighting a charcoal grill. If you don’t have any idea on how to light a charcoal grill, then read on and find out how to do it. Most die-hard fans of barbecue would agree that charcoal grill beats propane grill when it comes to flavor and aroma. Charcoal barbecue emits the rich smell and leaves a delicious carbon flavor on the meat. And for most cooks, there’s no better feeling than serving perfectly charred food. Sure, charcoal grill has its disadvantages like the annoying need to clean up ashes and grease. You also have to replenish the coals every hour or so, especially if you’re throwing a barbecue party. And heat can really be challenging to control. But charcoal grill remains very popular because it leaves a deep, smoky flavor on any food. It is best suited for searing meat like steak because it creates a hotter flame than gas grill, aside from the fact that it is less expensive. 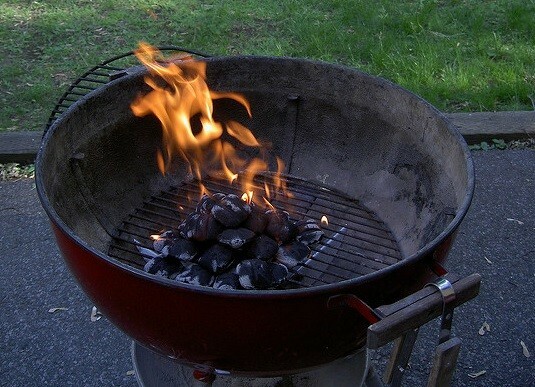 While it may sound like an easy task, lighting a charcoal grill is not as easy as it may seem. You certainly don’t want to look like dumb in front of your friends at your summer barbecue party. Worse, you don’t want to be given curious looks by your girlfriend’s dad just in case you come to their own summer get-together. While you can always pull out your smartphone and look for a YouTube video on how to light a charcoal grill, it is still better to know beforehand how to pull off the task. And knowing how to light a charcoal grill is one skill you want to learn so that your guests will be confident about your grilling skills just in case you host your own barbecue party. In lighting a charcoal grill, you’ll need the following tools, a lighter fluid, a stiff wire brush, a barbecue lighter, and charcoal. Start by emptying old ash which can obstruct vents and make it difficult for you to control the temperature. Get rid of leftover ash in the bottom of the grill, putting it into a bag and dispose it properly. Next up is cleaning the grates. This is very importantly especially if you are using a public grill as whatever mess left behind by the previous user should be removed, unless you want those particles to get into your food. No, don’t believe into what others may say about the leftover grease and food particles making your food more delicious and flavorful. The truth is that these particles will only make your food stick to the grill, resulting into a less than flavorful food. Using a stiff wire brush, scrape off the ash and food particles that were left from the last use of the charcoal grill. It is easier to clean the grates when the iron is still warm. But if it has been a long time since the grill was last used, be patient in removing the leftover grease and particles. You can also place the grill rack back in to a hot charcoal, as the heat should loosen the grease. In case you can’t find a stiff wire brush, you can ball up an aluminum foil. If there’s stuck on food that you can’t get rid of, there is a solution to that. A mixture of baking soda and vinegar should work together in breaking apart burnt-on food. Simply mix a cup of baking soda with two cups of vinegar in a plastic bag then seal the grates in the bag with a rubber band. Let it stand there overnight. Remove the grates then rinse them thoroughly. Leftover food should fall off. You may also scrub off the rest if there is still anything still stuck on the grates. Rinse with cool water before patting dry. Once the grates have been cleaned, start to place the charcoal briquettes. The technique here is to fill the bottom of the grill with charcoal, arranging them in a pyramid shape. The apex should be at the center of the grill. Then apply lighter fluid to the top briquettes. Spray it in an outward, circular motion until all the briquettes have been covered. You should leave enough fuel to properly light the charcoal. Let the liquid soak into the coals by waiting for five minutes. After five minutes, use a barbecue lighter to light the bottom of the pyramid. To distribute the heat evenly, you should light in several different spots. It could take as much as 30 minutes until the coals have been properly heated. They would die down after burning quickly at first. Just give them time to light up. Never spray lighter fluid with the aim of heating up the coals faster. You’d end up having barbecue tasting like gasoline. Once you notice that the coals are covered with white ash, use your tongs to spread the coals. Put the grate in position and remove any gunk. But how would you tell how hot the fire is? Simply hold your palm five inches above the fire. You would know that the temperature is somewhere between 400 and 500 degrees F if you can hold your palm for 2 to 4 seconds. If you can hold it for 5-7 seconds, the temperature is in ‘medium’ while if it is around 8 to 10 seconds, it is in ‘low’. If you can hold your hand for more than 10 seconds, you need to add more coal. Now your charcoal grill is ready to start grilling up those meats and vegetables. As you can see, lighting up a charcoal grill isn’t as complicated as it seems. Now that you know how to light up a charcoal grill, you don’t have to fear being in a barbecue party next summer. Summer is just around the corner, and you know what that means if you’re a foodie. Barbecue parties in just about every place. And when you say barbecue parties, you will definitely have to include cooking on a charcoal grill into the equation. After all, it is hard to dispute that food just tastes richer and tastier when cooked on a charcoal grill. Although there is a lot of controversy on eating food cooked on a charcoal grill and its link to cancer risks, what is hard to dispute is that the additional flavor that grilling imparts to food is what makes cooking on a charcoal grill very important. You know that with your barbecue. Plus grilled foods have less fat than foods that are cooked in pan since fat is able to drip away. But everyone knows that cooking on a charcoal grill isn’t as easy as frying an egg in a pan. Fortunately there are lots of charcoal grilling tips that you can refer to in making sure you get the most out of your grill. You should have the right charcoal grill if you want to make the juiciest and most mouthwatering dishes for your family members and friends. If you are to buy a charcoal grill, you should know the right surface area for your needs. A charcoal grill with limited surface area can pose a lot of problems if you are to grill for a large number of people. For example, if you are to cook for nine to ten guests, the charcoal grill space should be around 900 to 1000 square inches. A minimum of 1,000 square inches is needed if you are to throw a barbecue party for more than 10 people. In case the number of people is around four to five, you will need a grill with 400 to 500 square inches of space. You must also look at the features of the charcoal grill before buying one. For example, there are charcoal grills with rotiserrie which would add a charcoal flavor to a rotisserie chicken. You should also consider the type of ash removal that the grill has. There are grills that come with pans for ease in removal of the ashes. You’d also want a grill that has a sturdy and heavy duty steel cooking grate and charcoal grate. Other features that you would want from a charcoal grill are built-in thermostat and grill cover. The beauty of charcoal grilling is that you can grill basically every mouthwatering food out there. From steaks, hamburgers, chops, chicken, to brisket, you can cook them on a charcoal grill. You can also grill fish and vegetables. And it’s fun, too, as you can watch the food get cooked. Plus the unmistakable aroma of grilling can whet your appetite that other kinds of cooking can’t. In charcoal grilling, the food is placed directly over the radiant heat source. A distinct advantage is that it is the only grilling method where food can get the popular seared charcoal flavor, or char-broiled. It’s something you can’t get from a gas grill. A disadvantage is that charcoal grill can burn hotter than gas. It is thus harder to control heat but there are plenty of ways to do it successfully. In lighting a charcoal grill, you need to have charcoal briquettes or char wood. Place sheets of aluminum foil at the base of the grill before you put and light the coals. This would make it easier for you to clean the grill and disposed the used coals and its ashes. Now place the coals, stacking them in a pyramid shape right in the middle of the grill. This would also allow for air to flow and enable the coals to burn more efficiently and with less smoke. Spray lighter fluid on the charcoal; light enough just to get the briquettes soaked. As you get used to it, you will learn how to light the coals without the use of a lighter fluid by using plain old newspapers. Give it a minute or so for the coals to be soaked in fluid. Then using a match or a long-neck grill lighter, start the fire. Light the opposite sides of the stack quickly. Give the coals around 20 minutes or so to light and burn. You need them to be hot and glowing prior to grilling. 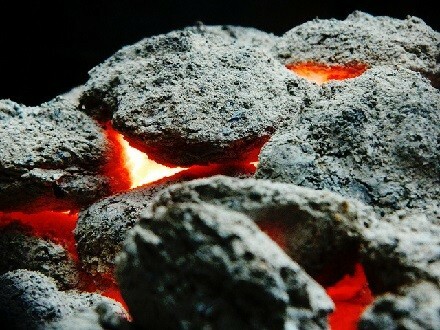 You would know that you can start cooking when the coals get that familiar ash gray color. There should be no smoke. Fan the coals gently so they would burn, or give it a few minutes before you start cooking. Using tongs, evenly spread the hot coals on the grate. The flames should have died down before you put the food on the grill. Now once you have placed the food on the grill, you need to control the temperature on the charcoal grill. Remember that this type of grill doesn’t have a temperature setting. Instead you will have to use the vents or dampers on the top of the lid and at the bottom of the grill to control the temperature. Both the top and bottom vents must be opened wide. The vents at the top are for trapping or releasing heat and smoke. The ones at the bottom are for cutting down oxygen supply, reducing fire, and extending the burning time of the coals. If there is too much heat, you can open the vents of the top of the lid so that some heat would escape. Then close the vents at the bottom. In case you need more heat, simply reverse the steps. Close the top vents and open the lower vents. You can also simply open the hinged lid, which is a feature in most large grills. For smaller grills, there’s a lid that comes right off. You can cover this once the fire is toned down. If you remove the lid, more oxygen will get into the coals and this will increase the fire. Temperature will vary depending on the food items you will cook. For example, grilling thin steaks, fish, and poultry usually require less than 30 minutes and on high heat. If cooked on low heat and for an extended period, said food items will dry out and lose their juices. To be able to monitor the temperature of the grill, use a grill thermometer. It is pretty inexpensive at around $3. It can help you avoid burning of food. In case you can’t get one, you can place an instant food or meat thermometer in one of the top vents so you can have an idea on the grill temperature. In case you are grilling larger food items such as lamb, ribs, and roasts, you should use the indirect grilling technique with less heat. You will have to lower the temperature so that the outside of the food is not burned, while the inside is well cooked. The key to cooking on a charcoal grill is to grill the foods at the right temperature. As much as possible, you should grill within the recommended temperature range and cooking time. Some people are good at just looking at the color of the food in determining whether the food they’re grilling is done or not. But not everyone is capable of pulling off this trick. Most of the time, the color can trick you into believing that the food is good and ready. There are also instances when the food is safe but its color outside looks raw. The ability to judge a food’s readiness or doneness just by looking at its color would get easy over time, as you get more grilling experience. Suffice to say, veteran cooks know when items are ready with one look at the food. Charcoal grilling may sound simple, but try to do it one time and you’ll definitely have your hands full. Read and understand the recipe to lower the risks of food poisoning and more importantly, avoid being disappointed with the outcome of your grilled dish. Create a checklist of the ingredients, tools, cooking times, and temperatures you will need or follow. Before grilling, lightly coat the food and cooking grill with a cooking spray. This should prevent the food from sticking on the grill. 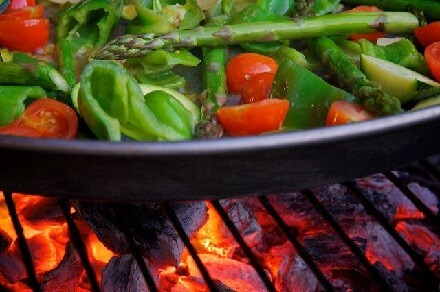 The food should be spaciously laid out on the cooking grill so you can see the coals as they burn. Also, keep a close eye on the fire. This would help you deal with flare-ups. If there are still food residue on the cooking grid from your previous grilling session, set the temperature to high so that the particles will be burned off. After a few minutes, use a grill wire brush in scraping off the residue. Then re-coat the grate with cooking oil. Use a tong in turning food, particularly chicken, steak, and other juicy foods. Don’t use a pitch fork to stab and turn the said food items because it can create a path for the juice to run off. But a pitch fork is ideal for turning chops, thin steaks, and hamburgers. Place an aluminum pan or a shallow metal under the cooking grid when you are grilling large food items. This would be for collecting the juices. Don’t use gasoline or kerosene in lighting the coals as this can cause explosion, resulting to burns. In case the coals don’t light up well, stack unlit coals over the glowing ones. Fan them gently. Charcoals grills are very easy to tip over. You should place yours on a flat and level surface. Moreover, don’t leave it unattended especially if you have small children or pets in your household. Grilled chicken is one of the favorite dishes cooked on a charcoal grill. It’s a crowd pleaser, something that young and old alike will love. Although the idea of grilling chicken over fire seems simple, the truth is that the meat is very prone to drying out. Grilled chicken drumstick is one of those chicken dishes that you would want to be cooked on a charcoal grill. After all, it is a dish that your kids and spouse would want to have for dinner. In grilling chicken pieces, medium hot fire and two-zone are needed. Two-zone means that the coals are banked to a side of the grill. Thus there’s a hot zone, and a cooler area. Light up a pile of briquettes. Once the coals are ready, arrange these in a two-zone fire. Remove the top lid, allowing the grill to heat up with all the vents open. To minimize the chances of flare up, excess fat should be trimmed from the chicken drumstick. You should also let the chicken sit in the refrigerator for an hour or to so that the marinade will penetrate the meat. The larger pieces should be placed on the hot side of the grate. Sear all the chicken pieces for around 3 minutes per side. Turn them only once until they become golden brown, and ensuring that the skin doesn’t char. In case the grill flares up, remove the chicken away from the coals. But what if you want to grill a whole chicken? Similar to roasting, the problem with grilling a whole chicken begins with its odd shape. Compounding matters is that the different parts of the chicken are to be cooked at different temperatures. The breast meat, for one, should not be cooked over 150 degrees Fahrenheit, and its leg should not be cooked more than 165 degrees. Thus you should “butterfly” the chicken. It is a technique for creating a uniform thickness throughout the chicken, so that the meat will be cooked quickly and evenly. As far as cooking is concerned, a slow and gentle grilling is ideal. When the chicken is cooked at high temperatures, the outer layers of the breast will be overcooked. You also want its skin to be crisp, and this involves high temperature to remove moisture, render excess fat, and browning of the proteins. Because there’s a need for high and low temperatures, a two-zone indirect fire is needed. As mentioned earlier, this is a method in which all the coals are piled up on one side. Perhaps one of the reasons why you are intent on learning how to cook on a charcoal grill is the chance to finally make your own steak. We all know how expensive steak is, so cooking your own is really a good and practical idea. Although you can also use a propane grill, a charcoal grill is much better because it can give your steak a smoky flavor. In cooking steak on a charcoal grill, you would have to ditch the charcoal briquettes in favor of hardwood logs and lump hardwood charcoal. The latter provides fast and high heat while smoking wood can add flavor and aroma to the food. You can get these in hardware and gourmet stores. And instead of the traditional pyramid method in stacking the coals, you should arrange them in an even layer. The pyramid method may prevent you from getting a range of temperatures in this case. The grill grate must be around four inches above the coals. You’ll know that you are ready to cook a steak when the charcoal glows red and there are some ashes beginning to appear. You will also know that the grill is in medium high heat (which is the best for a thick porterhouse) when you can hold your hands a few inches above the grate for a second or so. But before you put the steaks on the fire, you should bring them to room temperature first. Like in cooking other food, you should also rub oil on the grate. Once you have put the steaks, you should be ready to change their positions when needed. Thinner parts of each cut must stay on less intense part of the fire to avoid overcooking. Flare-ups would be normal, as the fat dripping onto the hot coals is unavoidable. Simply move the steak to another part of the grill. You should avoid flare ups because it can burn the surface of the meat and this could lead to unhealthy compounds forming on the steak. As much as possible, don’t flip the steaks more than once as it can disrupt the caramelization. Use tongs when flipping the steaks, as using fork or another implement will puncture the meat and let juices escape. Steaks will cook quickly over a hot grill. Touch and cut the steak often to see if they’re done. The steaks will continue to cook a couple of degrees more once they are taken off the grill. You’ll also know that the heat is medium when drops of red juices appear on the surface of a porterhouse steak or a rib-eye. Thus if you see those juices, it means you’ve missed your chance on a medium rare or rare. Fish is considered one of the hardest foods to grill, but you should be able to do so if you follow these tips. The key to grilling fish is preheating the grill on high. It can also help in caramelizing the fish, and minimize the time that the fish is on the grill. In turn, it lessens the risk of the food drying out. Moreover, it can prevent the fish from sticking into the grill. Remember that when in grilling fish, the temperature should be at medium to high heat. The temperature , depending on the recipe, is around 400 to 450 degrees Fahrenheit. In case you want to sear the flesh side, you need to oil the flesh side of the fish and put it down on the grate and grill. This will allow the fish to naturally release itself from the grate once it is done being grilled. If you aren’t inclined to sear, simply put the fish skin side directly on the grate. The general rule of thumb in grilling fish is to allot eight to 10 minutes of grilling time for every inch of fish. Once you are about to take it off the grill, slide the spatula in between the spot where the flesh and the skin meet. Then using a side-to-side motion, cut through the two areas so that the skin remains on the grate and the flesh piece is removed from the grill. Give the time around five minutes to rest after it was pulled out of the grill. This should be enough time for the juices to run back into the cut and make the fish more tender. If the fish you are grilling has no skin, let it sit for 10 minutes to bring it up to room temperature. Then generously oil both sides, add seasoning, and put it on the cooking grates. These steps will lessen the chances of the fish sticking into the grates. Flip the piece of fish only once while grilling. Don’t turn and flip it repeatedly, as it will likely break apart while being grilled. Don’t force the piece of fish off the grill when you need to flip it. Let the fish naturally release itself from the cooking grate. Again, give the fish 3-5 minutes to relax and let its juices run back to the cut of the fish. Follow these tips and you should be on your way to grilling up a flawless dinner. Whether it’s chicken, steak, or fish, that will impress anyone at your dinner table. As you can see, cooking on a charcoal grill isn’t that hard and complicated.